City centre businesses will soon be receiving the BID Final Consultation document. The document sets out information and priorities gathered over the last 12 months from potential BID levy paying businesses via the BID survey, face-to-face meetings and engagement events. The consultation highlighted there’s a strong desire for Leicester city centre to join the hundreds of other UK city and town centres in establishing a BID. Responses showed that businesses thought the BID should focus on delivering a more welcoming, more accessible and safer city centre that is better promoted to drive trade day and night and where the business community is actively supported. If you think we’ve missed anything out or included aspects that you don’t think need attention please let us know by Friday 26th May, you can also contact us using the comments section below. 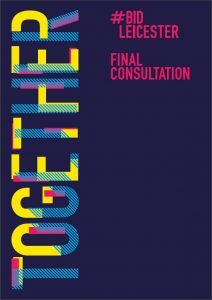 Along with the previous stage of consultation any comments on this document will inform the writing of the BID Business Plan, which is a more comprehensive document setting out the initiatives the BID will deliver and the budget allocated to each theme. This will effectively be the “manifesto” businesses will be asked to vote on come the ballot in October. This is your opportunity to input into how the the city centre is run and we hope businesses use this chance to ensure the BID represents your priorities and includes proposals that will genuinely make a positive impact on your trading environment.